Buy a serviced and tesed buffer board FPF47R-SDR60805, then send your old one back to receive credit...but please read the listing first! OFFER DESCRIPTION - PLEASE READ IN FULL! Coppell TV Repair offers you a serviced and tested buffer board FPF47R-SDR60805 similar to the one shown on the picture. The board will have one or more failed ICs replaced by a Coppell TV Repair LLC technician and would have passed a 10-20 minutes burning process to ensure its functionality. Once you receive and install it successfuly you can return your old buffer board FPF47R-SDR60805 to receive a credit for the amount stated towards the original payment, provided the returned buffer FPF47R-SDR60805 meets the specified criteria (see section below). 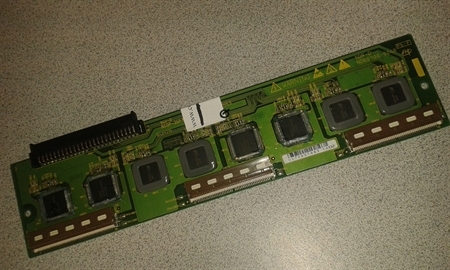 Buffer boards Hitachi FPF47R-SDR60805 usually fail because the ICs used on them have limited life under the conditions they operate; why do they have a limited life is a separate subject on which you may find more at our blog and elsewhere on Internet. When an IC fails on FPF47R-SDR60805, it usually fails alone, but the shock it creates to the system can sometimes lead to more ICs getting damaged, as well as components on other modules, specifically the sustain board. This actually holds true for most plasma TV buffer boards, not just FPF47R-SDR60805. Sometimes it is the sustain board or another board that causes the failure, in whichc case the buffers are the victim, not the source. The described tendency of the ICs on the buffer boards to wear out and fail means that it is always best to use brand new buffer boards as opposed to serviced or used ones unless, of course, a service takes care to replace all ICs on a buffer. When we service a buffer board we do not replace all ICs on it and neither does anyone else we know in this business. This is simply because it is cost prohibitive to do so. It is like bringing your car to a mechanic asking him to take it all apart and put it back together. It is too expensive. We replace the ICs that are bad, stick the board in a TV and burn-proof it for about 10-20 minutes before slating it for use / sale. There is no way of telling how much life it has in it. Could be a day, a week, a month, a year..nobody knows. You should use serviced buffers when out of other options and you should know that you are betting on job well done by you, service technicians as well as luck. The only way to get luck out of the picture is to use brand new, never used buffer boards; then if something fails you have a whole lot more ground to blame service technicians. 1) If you have a failed sustain board (in a particular way) it may cause any newly installed good working buffer board to fail; it is usually instant, but can sometimes take a while before a problem appears; of course that may also be due to a problem elsewhere, sucha s the main plasma logic board, which controls the sustain boards and tells them when and how to output sustain voltage. 2) As explained above all serviced buffer boards have decreased life expectancy that is not possible to measure upfront or predict. We put time and money in restoring and testing those buffer boards and given there are factors beyond our control that can damage them (pretty quickly at that) we are not comfortable giving any type of warranty beyond publicly confirming that we stand behind what we say in those listings. Instead, we disclose the facts to you, the buyer, and let you make a decision. We guarantee that every board has been serviced and tested, but we do NOT guarantee it will work at all, let alone for how long, on your end. We'd rather lose a sale than do the stupidity of promising something we can't control. By bringing your attention to that we sincerely hope you take the same approach and take responsibility for your own decision...take your time, do your research, decide if you trust us and once you do take your share of responsibility for the outcome. Installing Hitachi buffer FPF47R-SDR60805 is difficult. The most common issue and complaint we get is that newly installed buffer does not work as it has black horizontal lines accross the screen. This is because it is very difficult to properly insert the display plugs properly in the buffer's connectors. What usually happens is they do not get all the way in on either one or both sides - top and bottom - resulting in a partial or full lack of contact between the connector and the copper tracks on the plugs. There are two small ears on each plug - on top and bottom - and those need to get far enough inside to lay into a very tiny channels made for them; look closer and compare with the other connectors and you should be able to see the difference.